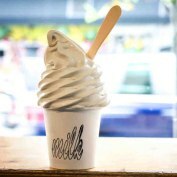 Milk Bar began its existence as a sister bakery of the Momofuku restaurant group in 2008. Just seven years later, this sweet little boutique brand has expanded in the most delightfully surprising way. There are now six shops in NY, one in Toronto and one opening soon in Washington DC. (Cross your fingers that your city is next.) Two cookbooks have been published, Momofuku Milk Bar and Milk Bar Life and at Target, you can buy Milk Bar baking mixes. There have been creative collaborations with notable brands such as American Express and Estee Lauder, and this year, Christina Tosi, the woman behind the Milk Bar magic, became a judge on Fox’s MasterChef series. In addition to making the world a sweeter place with delicious treats such as Cereal Milk soft-serve ice cream and Birthday Cake Truffles, Tosi brings an authentic exuberance to her brand that cannot be faked. Without gimmicks or large corporation tactics, she is winning loyalty and love from her customers and taking the brand world by storm. In the article, Sugar High in June's AdWeek Magazine, Tosi explains her refreshing take on how she markets Milk Bar and the uncommon roadmap for her brand. Despite the wild success and publicity Milk Bar has received, Tosi has resolved to maintain the purity of the brand and isn’t letting the fame affect its mission to "bring a creative and fun spirit to life." With a menu of top quality desserts with an almost mischievous nostalgic spin (Crack Pie, anyone?) we can envision and dream of having Milk Bars on every corner - but this isn’t the way Tosi wants to nurture the brand. In her own words, the secret to success is to, “Be honest and stay true to yourself.” The passion that drives Milk Bar is to make delicious desserts as daily celebrations and creative expressions – not just an end to a meal. In protecting this idea, trusting her instincts and believing in happy accidents, the brand grows and evolves to its own beat, endearing itself to consumers along the way. This kind of passion and strong brand identity is a powerful lesson for us all. Brands can easily let the essence of their mission fade with prospect of potential growth. Why Tosi’s brand is successful is because she defined success in a different way. She doesn’t let Milk Bar brand be diluted by fame, but by letting the mission drive its fame.